SimpleMed is an entirely FREE platform for Medical Students to learn and revise Medicine more easily, with concept-based articles and free multiple choice Quizzes! SimpleMed is built by Med Students, with only the key information needed and without the extra fluff - all with the aim of reducing the stress that students experience. We know that understanding concepts is what you need to succeed. Focused content written by actual current Medical students. Articles, Quizzes, an App, Quiz Stats and Leaderboards - all in one place. Check out the subjects you can start learning or revising today - new stuff is being added constantly! 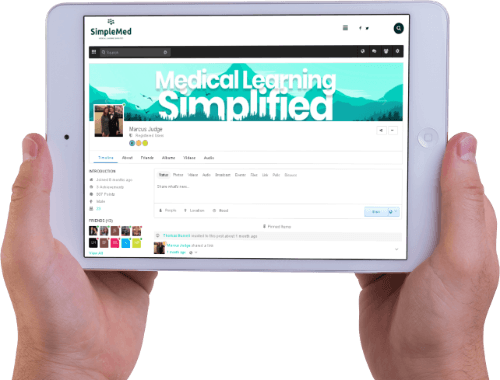 As well as being both a medical revision site and question bank, SimpleMed also includes a 100% free Social Network, designed for medical professionals and students to interact, post interesting discussions and network with eachother. Simply Sign-Up for free to be taken to your social profile, where you can begin posting and messaging other medical professionals within the SimpleMed community. SimpleMed can be free because ads generate the revenue needed to keep our servers alive. If you see an ad that interests you, click away - all of our ads are Google approved for safety!